What a great way to start off a new year. 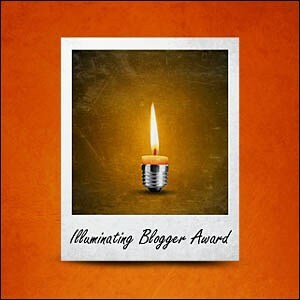 Dre at Grackle & Sun shared the Illuminating Blogger Award with Agujas. Dre illuminates me with her step-by-step yarn dyeing experiments. She uses only natural plant dyes and is even growing her own dye garden! She and her husband recently celebrated their 16th wedding anniversary. Thank you Dre and wishing you many more years full of joy! In return for the award, I must share one random thing about myself: I am trying to learn Mandarin Chinese. I’ve been taking classes at the Chinese Community Center and hope to travel to China so that I can practice. That is definitely the best part of these! Thank you for passing this on to me, what an honour. Thank you so much Veronica! I am so honored. This is just the inspiration I need to keep on blogging, and creating fun stuff to share to people out there. Enjoy! I look forward to seeing what inspires your next designs.